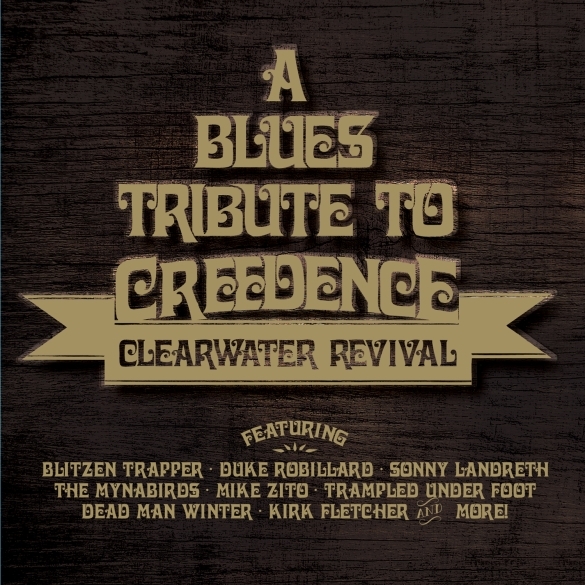 Blues Music Award Winners Trampled Under Foot & Mike Zito Lead An Array Of Stellar Blues Artists On A Salute To Creedence Clearwater Revival! Also features Blitzen Trapper, Duke Robillard, Sonny Landreth, The Mynabirds, and more! Los Angeles, CA – Proving once again that good songs know no bounds or genre, a host of superstar blues artists bring their immense skills and talents to bear on the classic rock canon of John Fogerty and his legendary Creedence Clearwater Revival. The result is a fascinating new perspective on the widely celebrated and deeply influential music of the great CCR! The project will see a release on CD this July 22 on Cleopatra Records. Founded in California’s San Francisco Bay Area in the late ‘60s, Creedence Clearwater Revival had their first taste of major success in 1969 with “Proud Mary,” a rollicking slice of swampy roots rock that rolled on the river to the No. 2 spot on the Billboard charts, and quickly became the group’s most covered song including an unforgettable 1971 version by Ike & Tina Turner. Hit after hit followed: “Bad Moon Rising,” “Green River,” “Down On The Corner,” “Fortunate Son,” and an absolutely astonishing string of 6 platinum-selling albums. Fogerty & Co. had not only achieved immense commercial success but they also came to be appreciated by music critics everywhere as one of the quintessential American rock bands, and fittingly were inducted into the Rock Hall Of Fame in 1993. Since the group’s breakup in 1972, numerous bands and artists have offered their own spins on CCR’s greatest songs, but none as unique as the versions heard here. Kicking things off is slide guitar legend Sonny Landreth’s brilliant transformation of “Fortunate Son’s” punchy, iconic riff into a shifty, multi-note melody as vocalist Mike Zito (of Royal Southern Brotherhood) sings along. Portland’s own Blitzen Trapper, a critical favorite of the blues-folk revivalist set, turns in a dirty stomping, harmonica and organ infused take on the classic “Proud Mary,” while another indie favorite The Mynabirds offer an appropriately spooky “Bad Moon Rising.” One of the biggest names in modern blues, the great Duke Robillard, shines on a heartbreaking rendition of “Who’ll Stop The Rain,” and what better way to close the album than with the 2014 Blues Music Awards winners for Contemporary Blues Album Of The Year, Trampled Under Foot, who stir up a potent gumbo of gritty vocals and shimmering guitar on “Born On The Bayou.” These treats and many more await fans of CCR, blues music, and lovers of timeless Americana rock!